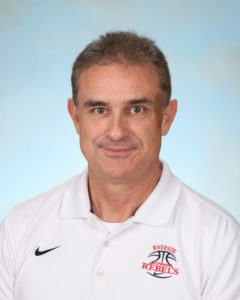 My name is Coach Timmy Byrd and I am the Athletic Director at Riverside Academy. We feel athletic competition is an important part of the overall educational experience. The lessons learned in athletics will serve our students well as they move onto college and become adults in our community. It is our goal to prepare our student athletes to compete at the highest levels in the state of Louisiana. In order to accomplish this, we work hard to provide the students at Riverside with the best athletic facilities, best instruction and the best coaching staffs possible. The foundation of our athletic program is our strength and conditioning program which is done through our PE classes. We start our student athletes in this program as early as 7th grade. As a result, all of our male and female athletes receive strength & training instruction every single day from a certified trainer. This has been critical to our success as an athletic department across all sports. We have worked hard to assemble a coaching staff that rivals that of any school in the state. This is true from our varsity programs all the way down through our middle school and elementary programs. At Riverside we also believe in encouraging our students to participate in multiple sports. Many studies show that the cross training provided by playing in multiple sports helps to prevent injuries. Most of our coaches handle multiple sports and this helps to foster a culture of sharing athletes in our athletic department. We have also partnered with Thibodaux Regional Hospital to have Ryan Trahan on staff at RA. Ryan is a certified trainer and is on site for home games across all sports and often travels with our teams as well. In this day and age we feel it is vital to ensure the safety of our students as they compete in athletics. Ryan is able to assess injured athletes on the spot, provide treatment to any injury, advise parents on the next step if going to a doctor is necessary and works with the physician on rehabilitation of that injury. Ryan will also advise our coaching staff on when it is safe for the student athlete to return to action. We are truly blessed to have someone with Ryan’s talents caring for our students. In addition to our varsity sports, we also offer a number of sports to our elementary and middle school students. Check out all that we have to offer from the menu of sports here on our main athletics page.